More and more cities are now using caution before wantonly installing red light cameras, which have proven over decades to have no safety benefit. Sure, all the money from Redflex and American Traffic Solutions (ATS) lobbyists is still appealing, but they tend not to donate to those who’ve lost their jobs after thwarting public will. 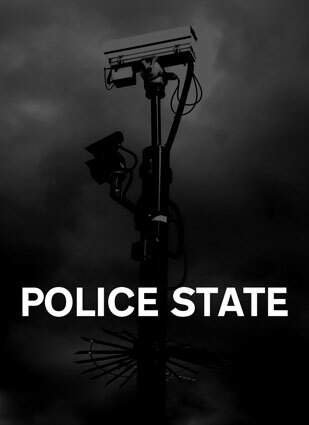 Syracuse, NY is the latest to take a wise step back and examine the situation before dotting their public roads with Big Brother. The city had been listening to bid from multiple vendors, which included both Redflex and ATS. News in the world of scameras was everywhere in 2010. It would be nearly impossible to cover it all, but we’d first like to thank our friends from across the country for providing endless info and effort to push back on the fraud that is photo ticketing. Our right sidebar is where you’ll find links to their websites filled with stories of volunteers fighting the same good fight that we have been since 2008 in Arizona. Collectively we accomplished a lot in 2010, but what’s coming in 2011 will more than likely be even bigger and better, so get ready. In the first part of this look back, we’ll give you stories #10 – #6. Tuesday will feature the top 5. 9. Stats from all over show that cameras create more dangerous intersections and roadways. Time and time again, statistics from independent studies and state departments of transportation show that camera installation is associated with increased accidents. Here are a few more examples (of many) that were released in 2010. 8. CameraFRAUD is covered by The Fox News Channel. Because of the magnitude of the scamera issue, national news coverage is nothing new, but this report by the infamous news outlet in March covered angles that had been neglected by other national press. 7. Paradise Valley photo radar and red light cam scam takes major heat. In September, Channel 10 gave us the chance to have a debate with former Police Chief John Wintersteen who has a very cozy relationship with both Redflex and ATS. Anaheim and Loma Linda saw major victories for the anti-photo ticketing movement. Anaheim was one of 5 cities that were able to vote on banning red light cameras and had the largest margin of victory with 73% casting their ballot to keep ATS’s automated ticketing machines out of their intersections. Loma Linda city council was presented with clear evidence that red light cams are dangerous and signal timing is what actually increases safety. In an amazing display of common sense and public service, the cameras were taken down and an extra second added to yellow light times. That city will undoubtedly see a decrease in collisions and more friendly intersections for motorists. Hopefully that action will serve as a model for many other municipalities who are actually trying to do the right thing and protect their citizens rights while increasing safety. This was the definition of win-win. Come back Tuesday for our Top 5 stories from 2010! 15-0 and Paradise Valley is Next to GO! With all five ballot initiatives to ban scameras across the country being upheld, it looks like the word is getting out on a national level that photo ticketing programs are not wanted by the people. In fact, all 15 times photo ticketing has gone to a public vote, it has been banned by the citizens. 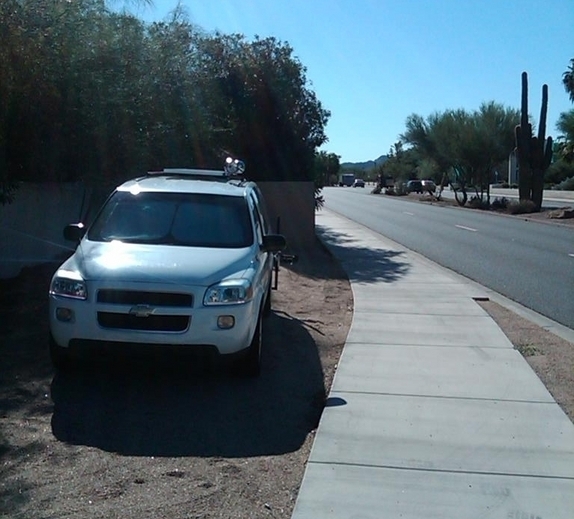 CameraFRAUD volunteers who collected signatures on election day (November 2nd) for the initiative to Ban Photo Ticketing and Redflex in Paradise Valley can tell you first-hand that residents of that town don’t want the scam on their streets either. The Washington Times just posted an editorial about the issue and the fact that Big Brother keeps losing at the ballot box. It’s time for elected officials to park the photo-radar vans and pull down the intersection spy cameras. Aside from a gullible minority, you’re not fooling anyone. Republicans, Democrats and independents rarely agree on issues of public policy, but on this they speak with one voice. State legislatures in Arkansas, Maine, Mississippi, Montana, Nevada, New Hampshire, South Carolina, Utah, West Virginia and Wisconsin have listened to the people and adopted statewide laws prohibiting automated enforcement. It’s time for the rest of the states to give Big Brother his walking papers. “Scariest Speed Camera of All” coming to Phoenix? 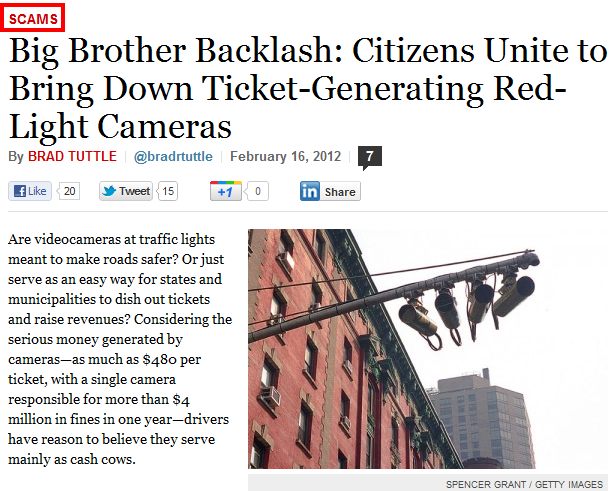 Actually, they’re already here because with the flip of a switch, the city of Phoenix can begin ticketing you for just about anything caught on Redflex intersection scameras and with speed camera vans. 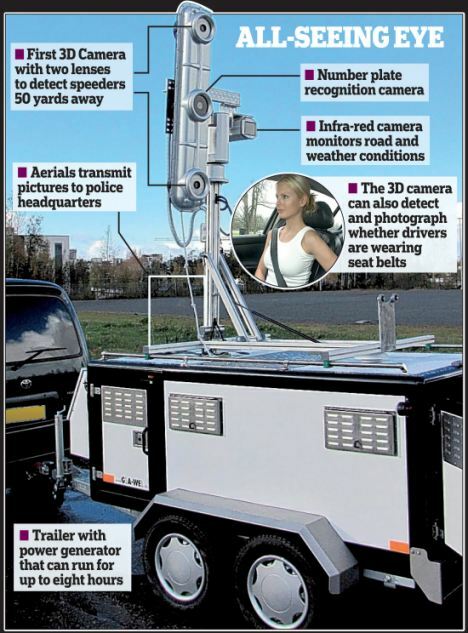 The Daily Mail, a newspaper out of the UK is reporting on a camera that can ticket drivers across the pond for alleged unpaid taxes, insurance, unfastened seat belts, or even tailgating! More from The Daily Mail. …Just don’t say it too loudly, or with the wrong tone of voice: you might be subject to arrest. Dutch company Sound Intelligence installed microphones in train stations, government buildings, prisons, as well as “London, Glasgow, Birmingham and Manchester” according to the article. The technology supposedly operates by detecting “tone of voice” changes which may indicate a fight or other crime is about to take place. Just like the company’s cousins in the automated ticketing business, all privacy and civil liberty concerns are downplayed and ignored. Photo enforcement and audio enforcement could go hand-in-hand. Redflex has a significant history in the area of audio technology: before primarily focusing on photo radar vans and “scameras,” the company specialized in secure communication links geared towards government and military applications. Of course, the Department of Homeland Security is headed by former Arizona Governor Janet Napolitano, who spearheaded the beleaguered Redflex statewide photo enforcement program. It’s becoming clearer with each passing day where the governments of supposedly free societies stand on civil liberties: with a jackboot on the throat of freedom. What a "photo yardwork" ticket might look like. Not satisfied with automated tickets for alleged traffic violations, Scottsdale-based American Traffic Solutions is boldly expanding their big-brother repertoire to go places never gone before: directly to your house. Violators face possible fines of $117, plus $50 in court costs if they fail to correct the violation within 15 days of receiving a warning letter. 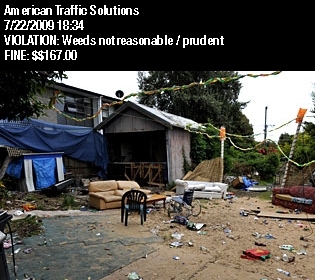 The new system also gives city-parish workers the right to clean up an uncooperative property owner’s parcel and add the costs to the owner’s annual tax bill. Almost a quarter of the population within Baton Rouge city limits live in poverty, according to 2007 census data. While $167 may sound steep for an automatically-generated ticket processed by a greedy, private company which received a large cash infusion from taxpayer-bailed-out Goldman Sachs, we hear that ATS might still be giving away some backpacks. How generous. Perhaps they can be boiled and eaten.